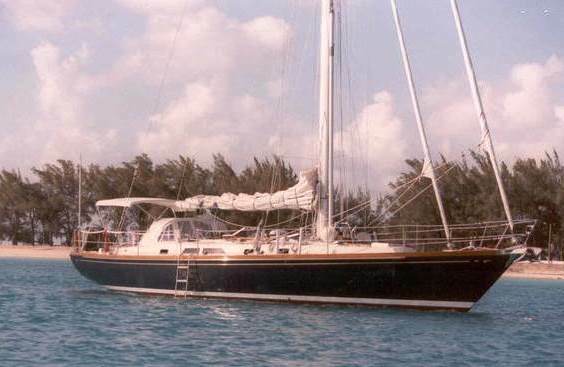 Cambrias were designed and built by David Walters Yachts. The design criterion was for a fast, comfortable, performance cruising design built to the same quality standards as Hinckley, Alden and Little Harbor yachts. The Hazen stern speed prediction program was used to confirm performance and stability objectives before building began. After setting up a building facility in Portsmouth, RI, the molds were built for the hull and deck. The first Cambria was launched in late 1983 and introduced at the Annapolis Boat Show in 1984, where Hull #’s 2, 3 and 4 boats were sold. Two years later, David Walters designed Cambrias were featured in Ferenc Maté’s The World’s Best Sailboats, and the 40 was introduced. The construction of the Cambria is Airex cored hulls and Divinycell cored decks. The advantage of the hull core is superior strength for the same weight and thermal and sound insulation benefits. The entire boat was engineered to exceed Lloyds’ and ABS standards (American Bureau of Shipping). 20 Cambrias were built from the larger molds. All the larger models, including the 44, 46, 48 and 50 have the same 37’ waterline length, two sleeping cabins and owner and guest heads. The boat was originally introduced as a 44, which was its on deck length, and had an overall length of 46’ from the bow to the tip of the reverse stern. Eight Cambrias were built from the 40 molds. The 40 designs have a single entry, large V berth cabin forward, additional sleeping in a quarter berth and salon settees and single head with separate stall shower. When Chris Reeve came to build a Cambria, he did not want a double entry 44. A new deck mold with a single entry was built, and was designated the new 46 model. Four Cambrias were built using this new deck mold; three with the standard keel with board, and one with a deep custom fin keel with spade rudder. Most Cambrias of all sizes were built with a shoal draft keel with centerboard and skeg protected rudders. Many owners never drop the boards because the Cambrias sail so well on all points, including to windward, with the board in the raised position. With the board lowered, windward performance is enhanced. The 6’ draft with the board up allowed entry to a large number of harbors and anchorages not available to deeper, fixed keel designs. Only four Cambrias were built with deeper fixed keels. Many of the Cambria owners sail much of the time with two, and with additional accommodations for a second couple or a family of 6. Most of the Cambrias were built with varnished teak interiors. The majority of use is for cruising. However, when raced, the Cambrias placed well in local and offshore races. Over the years, surveyors confirmed her construction and finish to be comparable to the highest quality yachts built in the US and Europe. After Sail, Beautiful, Perfect, Power for Sailors!